Here 'k' is the first order rate constant and n = 1. This signifies that the rate of consumption of A at any specified time is directly proportional to the first power of the concentration of A at that particular time. 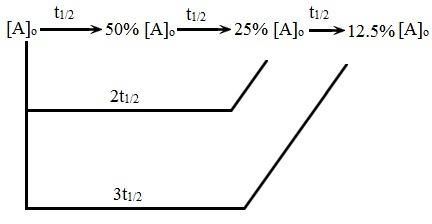 The transformation of ln([A]o/[A]t) = kt into [A]t = [A]o e-kt could be illustrated as shown. Corresponding to the equation above, we can draw the concentration versus time plot for the first order reaction. This curve is of the kind illustrated in the figure shown below. 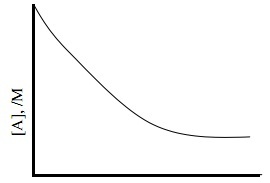 Such a curve is termed as an exponential decay curve. In an exponential decay curve, there is an initial steep decrease in concentration; this is followed via a slow decrease in concentration. It will be noted that the decay curve goes parallel to x-axis after longer time intervals, point out that the reaction will take infinite time for completion. The Radioactive decay is a good illustration of first order/reaction. The equation above is helpful in computing the concentration of the reactant at a time t (that is, [A]t) provided; its initial concentration (that is, [A]o), k and t are acknowledged. As well 'k' can be computed if [A]0, [A]t and t are known. By using the graphical technique, we can test whether a reactant follows the first order or not. The given hints might be helpful while computing the rate constant by using the integrated rate law. A) If the concentrations of the reactant are provided at different time intervals, then the concentration at t = 0 is equivalent to [A]0 and the concentration at any specified time is [A]t; log [A]t against t plot is made. Here, (PA)0 and (PA)t are the partial pressures of the reactant at the beginning and after a time, t.
C) At times, the rates of measurement are made in terms of the concentrations of the product made. If the Stoichiometry of the reaction is such that one molecule of the product is made if one molecule of the reactant is consumed then the concentration of the product at t = ∞ must be equivalent to initial concentration of the reactant. Let us suppose that the concentration of the product at any particular time is x. Then x as well symbolizes the decrease in the concentration of the reactant after a time, t. Therefore [A]0 = concentration of the product at t = ∞ and [A]t = [A]0 - x .
is similar. The half-life periods needed to bring about decrease in concentration of a reactant up to 12.5% of its initial concentration can be symbolized as in the figure shown below. A) A single reactant could give mount to products via a second order reaction. Here, 'k' is the second order rate constant. B) The two different reactant molecules could react to give products via a second order reaction. Illustrations of this kind are given below. It will be noted that the stoichiometric ratio to the reactant is 1:1.
b) First order in each of the two reactants in such a way that the concentrations of the two are similar all through the reaction. For reactions following the second order rate with respect to equation [rate = -d[A]/dt = k[A]2] an equation could be derived which is helpful in computing the half-life period. From the above, we understand that t1/2 is inversely proportional to the initial concentration for second order reaction. As initial concentration of the reactant reduces, t1/2 increases. If for the decrease in concentration of A to 50% of its initial value, time needed is 100s, then for the change from 50% A to 25% A, it will need 200s. The three successive half-lives for a second order reaction can be symbolized by the figure shown above.